The phospho-IRF3 (Ser386) assay enables the cell-based detection of Ser386 phosphorylation on IRF3. The phospho-IRF3 cell based assay kit conveniently and accurately quantifies phosphorylated IRF3 at Ser386. In viral infected cells, phosphorylation of transcription factor IRF3 induces the production of antiviral and proinflammatory cytokines, a key element in the innate immunity system. 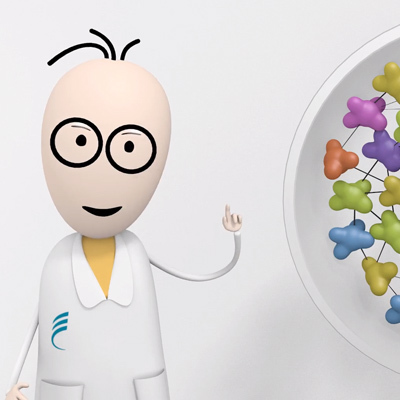 This phospho-IRF3 assay can be used from basic research through to preclinical drug discovery phases and contains everything you need. It offers increased throughput compared to ELISA/WB. The phospho-IRF3 (Ser386) assay measures IRF3 when phosphorylated at Ser386. Contrary to Western Blot, the assay is entirely plate-based and does not require gels, electrophoresis or transfer. The phospho-IRF3 (Ser386) assay uses 2 labeled antibodies: one with a donor fluorophore, the other one with an acceptor. The first antibody is selected for its specific binding to the phosphorylated motif on the protein, the second for its ability to recognize the protein independent of its phosphorylation state. Protein phosphorylation enables an immune-complex formation involving both labeled antibodies and which brings the donor fluorophore into close proximity to the acceptor, thereby generating a FRET signal. 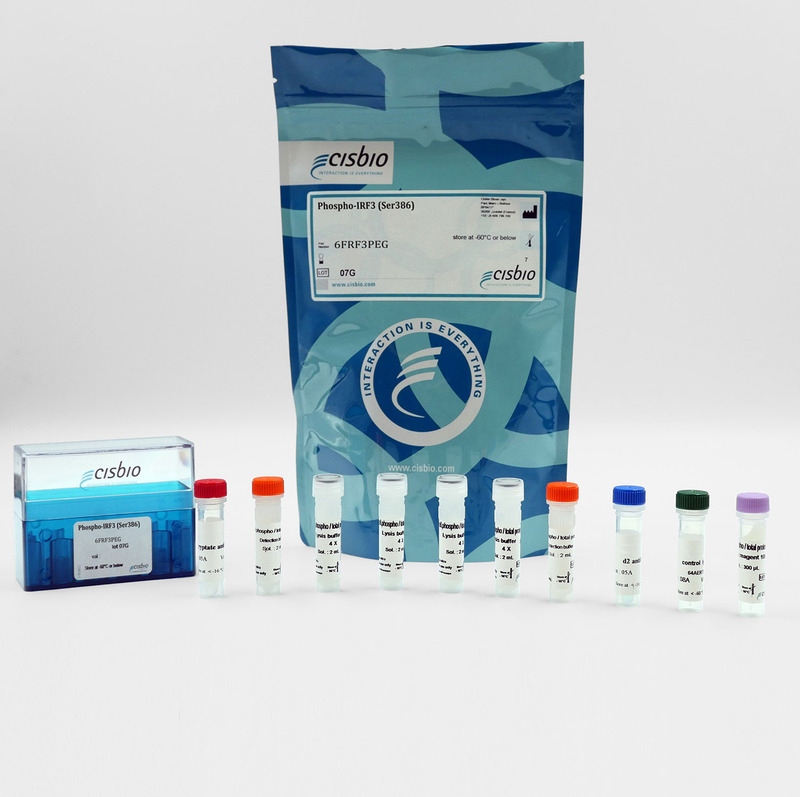 Its intensity is directly proportional to the concentration of phosphorylated protein present in the sample, and provides a means of assessing the proteins phosphorylation state under a no-wash assay format. The 2 plate protocol involves culturing cells in a 96-well plate before lysis then transferring lysates to a 384-well low volume detection plate before adding phospho-IRF3 (Ser386) HTRF detection reagents. This protocol enables the cells' viability and confluence to be monitored. Detection of Phosphorylated IRF3 (Ser386) with HTRF reagents can be performed in a single plate used for culturing, stimulation and lysis. No washing steps are required. This HTS designed protocol enables miniaturization while maintaining robust HTRF quality. Calyculin, a potent serine/threonine protein phosphatase inhibitor, was used to induce phosphorylation of IRF3 in MCF7 cells. After treatment for various incubation times (45 minutes, 1 hour, 2 hours, or 3 hours) with 400 nM Calyculin, MCF7 cells were lysed with 50 µL of supplemented lysis buffer and incubated for 30 min at RT under gentle shaking. 16 µL of lysate were transferred into a 384-well low volume white microplate before the addition of 4 µL of the HTRF phospho-IRF3 detection reagents. The HTRF signal was recorded after an overnight incubation. 125,000 MCF7 cells per well were pated in a 96-well pate in complete culture medium and incubated for 24h at 37°C, 5% CO2. 50 µg/mL of 2-3 cGAMP was added and then incubated for various incubation time at 37°C. After cell culture removal the cells were lysed with 50 µL of lysis buffer for 30 min at RT, 16 µL of lysate were then transferred into a 384-well sv white pate and 4 µL of the HTRF phospho-IRF3 detection reagents were added. The HTRF signal was recovered after over-night incubation. Human MCF7 cells were cultured for 48 hours and then stimulated with 200nM calyculin for 2 hours lysing. 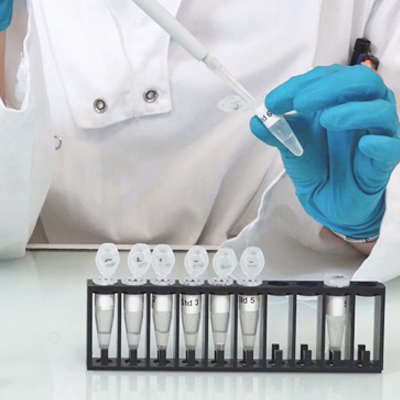 Soluble fractions were collected via centrifugation and serial dilutions of the cell lysate were performed in the supplemented lysis buffer and 16 µL of each dilution were dispensed and analyzed side-by-side by Western-blot and by HTRF. 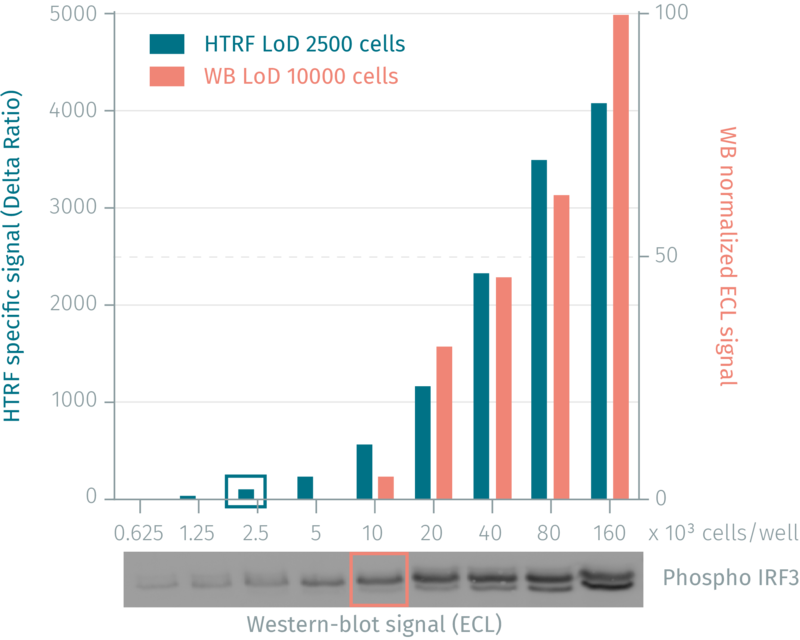 By using HTRF phospho-IRF3 (Ser386) only 2,500 cells are sufficient for minimal signal detection while 10,000 cells are needed for a Western Blot signal. The HTRF phospho-IRF3 assay is at least 4-fold more sensitive than the Western-blot. IRF3 is a key transcriptional regulator of type I interferon (IFN-alpha and IFN-beta)-dependent immune responses. It plays a critical role in the innate immune response against DNA and RNA viruses. Found in an inactive form in the cytoplasm of uninfected cells, IRF3 becomes phosphorylated at Ser 386 by TBK1, following viral infection, double-stranded RNA (dsRNA), Toll-like receptor (TLR) and STING signaling pathways. This induces a conformational change, leading to its dimerization and nuclear localization where it can activate type I IFN gene expression.